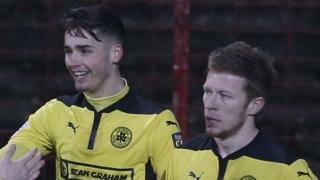 Jay Donnelly and Stephen Garrett are on target at the Oval as Cliftonville beat Glentoran 2-0 in the Irish Premiership. Cliftonville, beaten in their last two league matches, took a sixth-minute lead through Jay Donnelly. Garret made it 2-0 in the second half to leave Glentoran with just six points from their last eight games.